Spotlight has been shone from countless directions upon Iceland’s respective national teams in recent times, although the intimate Nordic nation’s international footballing progress is no overnight story. The UEFA Women’s Euro 2017 was the third major tournament for the ‘dóttirs’ and for their defender Sif Atladóttir, an individual who personifies the patriotic valour and vibrancy on which her team runs. Chemistry and spirit within a team. Clubs all around the world at this moment have it, while countless others are spending time and resources trying to piece together that magical formula. You can mix and match with certain ingredients but some will always be non-negotiable when it comes to composing a team that plays to a tune of togetherness. In international football, Iceland have emerged as a consummate example, yet a unique flavour in so many senses. When taking on the rest of the world, it’s hard to feel too detached from those on your side when you come from an island of 334,000 people (stop me if you’ve heard their population referenced a few times before). At the Women’s Euros this summer in the Netherlands, the Icelandic contingent went way into the thousands once more, in a blue and white wave of community, noise and feeling that could only be admired by those from other nations, perhaps wishing they too could slip a ‘s/sson’ or ‘dóttir’ into their name for the moment. Togetherness can smash down obstacles and climb mountains, but ability is every bit an essential, and Iceland have some potent shots of that to serve up as well. Although Freyr Alexandersson’s team, who had qualified for the Euros as group winners with a watertight defence and rampaging attack, would not contest the later stages this time, their fluid blend of experience and fresh potential could well yield much more in the future. The jauntiness sparkles throughout the team and is charmingly characterised by defensive leader Sif Atladóttir, a senior squad member playing with a topped-up vigour since returning from the birth of her daughter, Sólveig, two-and-a-half years ago. The Kristianstads DFF stalwart was there as Iceland debuted at Euro 2009 and set a new benchmark with a quarter-final place in 2013. Just as teammates like midfielder Hólmfríður Magnúsdóttir, perpetual goal threat Margrét Lára Viðarsdóttir and keeper Guðbjörg Gunnarsdóttir have remained from Sif’s beginnings with the senior side, so too has the musical firepower that surrounds them, as she explains. “I think we listen a lot to Icelandic music when we come together. The band Stuðmenn has a song that is played pretty often called ‘Betri tíð,’ which we like. The 2004 Icelandic Idol winner Kalli Bjarni is responsible for one significant segment of the team’s soundtrack, with his song ‘Við lifum aðeins einu sinni’ (‘We only live once’) spinning around their playlist block more times than their forward Fanndís Friðriksdóttir has wriggled beyond defenders! Left-sider Hallbera Guðný Gísladóttir, aka the team’s ‘DJ Razzberry’, featured on here in February, and told along the way how Friðriksdóttir and captain Sara Björk Gunnarsdóttir sang an entertainingly off-key ‘Say My Name’ (Destiny’s Child) in a Portuguese karaoke bar once upon a time. Whether the result is groundbreaking or glass-shattering, Sif recognises the special power of trying to hit some notes together as a team! “Anyone who has sung along with a group – and nobody in that group cares if you are tone-deaf or if you are Whitney Houston – knows that just by that gesture of expanding your vocals together, you bond just a little bit more. So you can say that music helps turn things up when needed and slow things down when needed. Spending a year in Germany with 1. FC Saarbrücken before joining her current club, top-flight Swedish Damallsvenskan side Kristianstads DFF in 2011, Sif has been known to let the rhythm flow with some regularity, by way of her locker-room dance moves. Aside from vibing off the beat to help her crank up that ‘game face’ mode, the young daughter she held in her arms on the pitch after the final whistle during the Euros reminds her that things can never always be so serious. “My daughter has a big say in what is played at home and the soundtrack from Trolls is a favourite, so there is a lot of dancing and singing to that. I’m kind of an all-around music lover; if something catches my attention I tend to listen a lot to that specific type of music. Coming from a unanimously footballing family, Sif is the daughter of Atli Eðvaldsson, once a goalscoring midfielder with the likes of Borussia Dortmund, as well as a former player and manager of Iceland’s men’s national team. Her uncle is Jóhannes Eðvaldsson, the rugged centre-back who was a cult hero at the legendary Jock Stein’s Celtic in the 1970s, where he was known as ‘Shuggie’ and often came up with a goal (sensing a pattern here?). Sif’s sister, Sara, and two brothers, Egill and Emil, are all also involved in playing or coaching, while even her husband Björn ‘Bjössi’ Sigurbjörnsson works as an assistant coach…at Kristianstad! Music and football go together like telepathic strike partners – think of how powerful a clip of a classic goal feels to watch when layered with a hit song from that time period – and there are specific tracks which now act as easily-accessible capsules of nostalgia for Sif. “I have a song with my current team that always reminds me of them and that is ‘On the Floor’ by J.Lo (featuring Pitbull). ‘Memories’ by (David Guetta featuring) Kid Cudi, and Xavier Naidoo’s song ‘Dieser Weg’ reminds me of my time playing in Saarbrücken, Germany. “Like I said before, special songs have special meaning to me and for a good reason. 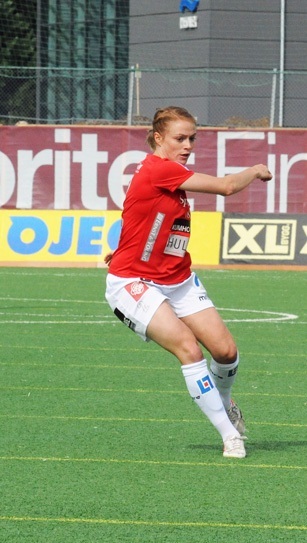 Mist Edvardsdóttir, who plays for Valur in Iceland, knows every song lyric that is out there, or it seems like that. Colleagues who bring creativity and multiple talents to the party outside of just doing their day job can brighten up the weeks for those around them. In football, those sorts of teammates can help make the time pass a bit quicker on long journeys or during the hours in camp when the on-field work has concluded for the day. If you look around women’s football, you will uncover singing talents in just about every league you can think of. Sif, who won the first of her 66 senior international caps against Italy at the Algarve Cup as a 21-year-old in 2007, wouldn’t place herself in that sort of company, though she did go all in when called to the stage as a newcomer once, as she recalls. “Yes, I had to do that for my initiation to the A national team. I wore fire red tights and had an iPod in my ear and I sang a song by the awesome Tenacious D.
The infrastructural football changes made in Iceland in the early part of this century have been increasingly documented recently, and naturally cited as drivers behind the growing top-level impact of its national teams. A compulsory professional standard of coaching for youngsters is one condition – to coach at Under-10 level you must hold the UEFA B Licence, while half of it must have been completed if you are to work with Under-8s. Along with building artificial pitches on land purchased by the Icelandic FA, there was also the introduction of indoor football halls around the country, which are heated and open to all, with coaches on hand. As well as allowing players to continue to train and compete during Iceland’s harsh winter months, one of those auditoriums, Kórinn in Kópavogur, also played host to two sold-out shows from Justin Bieber last September. The question is, if Sif had her own venue and her pick of any bands or artists, past or present, to come and perform, who would be on that wish list? “The artists I would want to see are: Adele, Ed Sheeran, Beyoncé, Michael Jackson, Prince, The Beatles, Elton John, Tina Turner, but I think I could go on and on. There are just too many who I would want to see. There is, however, one notable act missing from that list. Given the pride of place Sif used to give to them, surely these now-seasoned pros would take a headline spot at any festival she organised? “I probably bought the second Backstreet Boys album, ‘Backstreet’s Back,’ as my first album. I was obsessed with them when I was younger; I was maybe 12/13 years old and my room was plastered with pictures of them from Bravo magazines. “Then one of my all-time favourites is Michael Jackson, but Backstreet Boys were the ones that made me wanna dance first. I even made up a dance to the song ‘Everybody (Backstreet’s Back),’ that my friends and I showed at a school event. The field was the only platform Sif really needed, though, and she comes from a town linked to a number of noteworthy performers; from handballers to Everton midfielder Gylfi Sigurðsson, and even Iceland’s 2009 Eurovision singing representative, Jóhanna Guðrún Jónsdóttir. Sif was born in Germany during her dad’s stint with Fortuna Düsseldorf but moved to her hometown a few miles south of Reykjavík as a five-year-old. “I was born in Düsseldorf and I lived there for four years and then one year in Turkey, when my dad played there (at Gençlerbirliği) for a year. After that, we moved to Iceland and I grew up in a town called Hafnarfjördur. “My mom grew up there and I’m so glad I did; it was such a great place to live at. My mom still lives in the house I grew up in, so it’s pretty cool going home and seeing how big everything has gotten there in the years we’ve lived there. “When I was young, my mom would always take my older brother and I to the games when dad was playing. I don’t remember them so much but even after my younger siblings were born we always went to dad’s games; it didn’t matter if he was playing or coaching. “Football has always been a huge part of our family. I really didn’t get into football until I was about 15 years old; I was in track and field before, but my siblings were always in football. “My older brother, Egill, is coaching HK/Víkingur in division one women, and my sister, Sara, is on baby leave from coaching Fjardarbyggd/Höttur/Leiknir, a division two women’s team; she just had her second baby boy. My youngest brother, Emil, is still playing but he suffered an ACL injury in the beginning of the season so he is recovering from that. 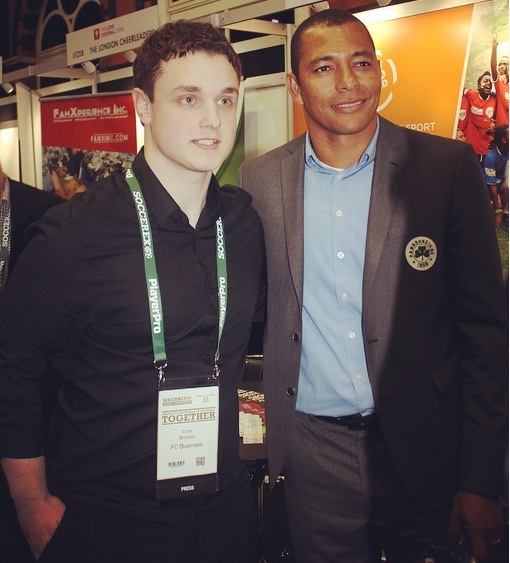 “So we’re all involved in some way with football. I was in a lot of sports but was fearful, so when I was supposed to train with the older kids, I couldn’t, and moved sports until I started track and field. A three-time consecutive title winner back home with Valur before moving to Germany, Sif was the one putting her body on the line to protect Iceland’s goal this summer. However, she has a goalscoring past herself as a former attacker, so if she could spend some time on the training field practicing the most fun part of this game we love – lining up some shots, of course – who would she choose to join her, if she could get any player along, male or female, past or present? What a player remembers long after the floodlights have gone down on their career is the chills of hearing their national anthem, the crack of a crucial goal hitting the net, or maybe the surge they feel inside when the referee’s whistle confirms that win they’ve run their heart out for. Right in amongst those finer details are the ones who stood alongside them in those big moments, so at the end of this conversation’s first half, let’s mark that in a different way and take Sif from the stadium to the studio. The rules to this regular question are simple, with the interviewee asked for any current or former teammate(s) to record a song cover with. In Sif’s all-inclusive vision for this one, Iceland and Sweden are leading the way. “With the thought of what is going on in the world, I think I would pick Michael Jackson’s song ‘Heal the World.’ I think I’m lucky to get to play with so many different nationalities and getting to know different cultures; I would pick that song for the message it brings. “We should help one another and help each other to shine. Every person you meet has a unique story and you can always learn something from them. 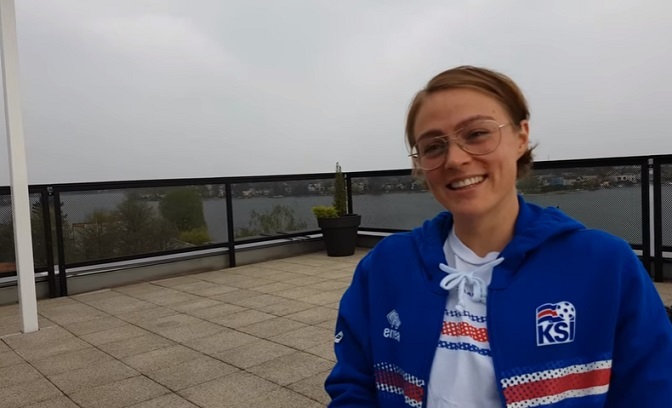 Still to come in the second half of this interview, Sif’s candid insight into the long, uphill and very personal road to representing Iceland at a third tournament, more of what connects with her and what makes her move, as we continue on through life and music, plus post-game pizzas, teammates and even more still!